This entry was posted in Comments about Cycling on February 18, 2013 by Steve Tilford. Okay, hopefully this will be the last I post about anything to do with this stupid shoulder surgery for a while. These days are melting into each other and I haven’t really been reading too much cycling related news, plus my mind is a marshmallow. Hopefully I have this gastrointestinal thing figured out and I’ll be on easy street today. It snowed up here in Summit County, again, so the “commute” over to Vail gets sort of ugly. They don’t use salt on the roads here so it is actually a little dicey even when it has snowed only a small amount. Something that I didn’t even know existed and now use the majority of the day is this Breg Polar Pack I got from my friend Stacie in Louisville. They use Game Ready machines at the Steadman Clinic, but insurance doesn’t pay for it and the Game Ready machines are astronomically expensive. The Breg does all I need it for and it is super portable. These machines are really just continuous ice packs. 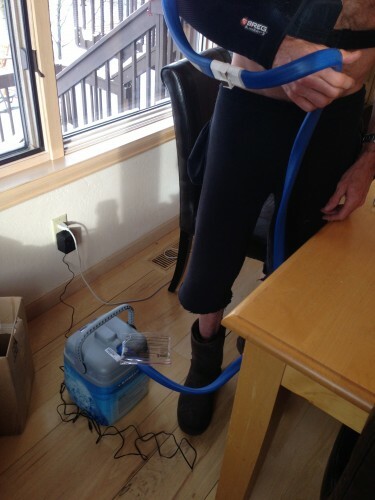 You fill them full of ice, with a little water, and they have a pump that circulates ice cold water to a compression sleeve, via insulated hoses. I’m obviously using the shoulder sleeve, but they make different sleeves for knees, ankles, wrists, etc. Anyway, you aren’t supposed to wear it all the time, but I’ve been wearing it on and off the majority of the day and nights, the past 4 days. The cold makes the pain much less, plus I suppose it aids in the healing process. The physical therapist yesterday told me that 50% of the healing of this surgery occurs during the first two weeks, then 80% after 6 weeks and 95% at 12 weeks. I don’t talk to the doctor again for another week and a half, so I’m not sure what my schedule is as of now. The therapy is leaving me a little more zonked than I had originally planned for. I don’t know anything about this whole process, so I’m just doing what they say as of now. Hopefully I can convince myself to stay on this plan. This is about the happiest picture I could take this morning. 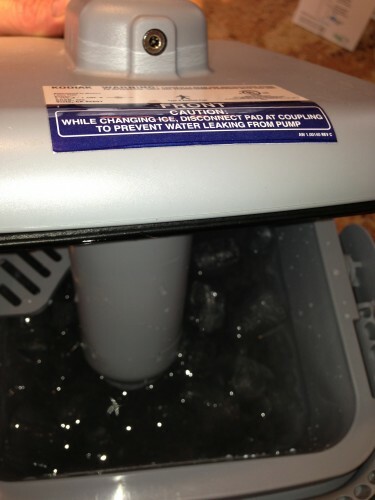 IT’s just a little ice chest that holds ice and water, with a pump. I carry it around with me everywhere. 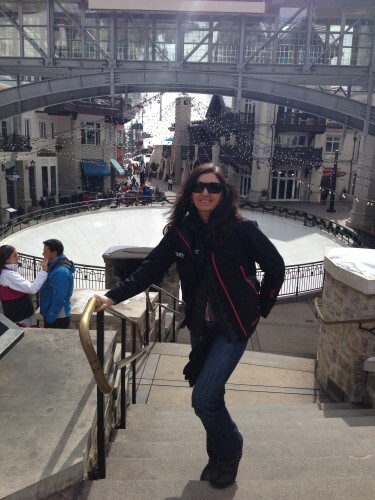 This is Trudi in front of the skating ring by the Lion’s Head Gondola. There is usually a couple hours between PT treatments and the walking does me good. The painkillers trashed my stomach as well. I found that prilosec helped, as did yogurt. Prilosec is an over the counter medication for heartburn. The generic worked fine for me. You might try these if you’re having stomach problems on the narcotics. If you want to work on something, work on scheduling the pain killers further and further apart during the day. You can also work on trying to stay awake during the day. None of that was easy for me in the first week or so. But, it was something for my mind to work on. Hopefully, you’ll give yourself lots of time to recover. the game ready might be able to get covered in some insurances because of the compression therapy which is legit. I used the game ready for my shoulder. AWESOME piece of equipment. I’m seeing some irony here. You’re in Vail Colorado. Beautiful snow outside. Trudi’s is dressed for the ski country. Steve is dressed for a day at the beach but wearing an electric ice pack. And by the way Channel Zero, thanks that’s some good advice. This surgery is going to require more patience than you know. The pain will last longer than anyone is telling you. That said, find something else to focus on, something new. Change your mindset for the next 4 to 6 months.Travel, volunteer, walk, coach, any thing but ride, or do tile etc. Your goal is to heal. I would bet Trudi wouldn’t mind some beach time. I like your blog but if it went quiet for a while that would be OK too. Then again do whats best for you. 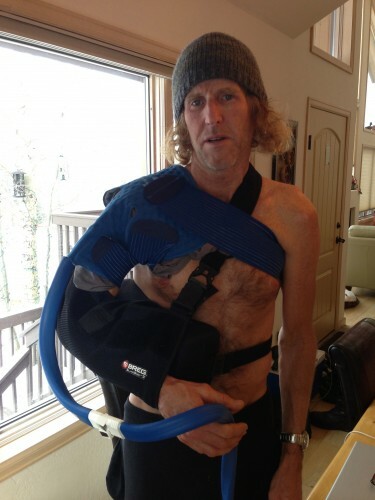 Jim D.
Surgery is the easy part, rehab and recovery are the true challenge. Stay patient and dilligent. Soon you will be back at it but do not push too hard right now. It’s funny to me that I70 over Vail Pass was dicey, yet after over several inches of snow, US40 over Berthoud Pass was fairly uneventful. I would have thought it would be the other way around.